An alert, compact dog of medium size and substance; square in profile, close coupled; the well-proportioned head slightly but not overly large for the body. The short, harsh coat, the loose skin covering the head and body, the small ears, the "hippopotamus" muzzle shape and the high set tail impart to the Shar-Pei a unique look peculiar to him alone. The loose skin and wrinkles covering the head, neck and body are superabundant in puppies but these features may be limited to the head, neck and withers in the adult. The head is large, slightly, but not overly, proudly carried and covered with profuse wrinkles on the forehead continuing into side wrinkles framing the face. Eyes - Dark, small, almond-shaped and sunken, displaying a scowling expression. In the dilute colored dogs the eye color may be lighter. Ears - extremely small, rather thick, equilateral triangles in shape, slightly rounded at the tips; edges of the ear may curl. Ears lie flat against the head, are set high, wide apart and forward on the skull, pointing toward the eyes. The ears have the ability to move. A pricked ear is a disqualification. Skull - flat and broad, the stop moderately defined. Muzzle - one of the distinctive features of the breed. It is broad and full with no suggestion of snipiness. (The length from nose to stop is approximately the same as from stop to occiput.) Nose large and wide and darkly pigmented, preferably black but any color conforming to the general coat color of the dog is acceptable. In dilute colors, the preferred nose is self-colored. Darkly pigmented cream Shar-Pei may have some light pigment either in the center of the nose or on the entire nose. The lips and top of muzzle are well-padded and may cause a slight bulge above the nose. Tongue, roof of mouth, gums and flews - solid bluish-black is preferred in all coat colors except in dilute colors, which have a solid lavender pigmentation. A spotted pink tongue is a major fault. A solid pink tongue is a disqualification. (Tongue colors may lighten due to heat stress; care must be taken not to confuse dilute pigmentation with a pink tongue.) Teeth - strong, meeting in a scissors bite. Deviation from a scissors bite is a major fault. Shoulders - muscular, well laid back and sloping. Forelegs - when viewed from the front, straight moderately spaced, with elbows close to the body. When viewed from the side, the forelegs are straight, the pasterns are strong and flexible. The bone is substantial but never heavy and is of moderate length. Removal of front dewclaws is optional. Feet - moderate in size, compact and firmly set, not splayed. The extremely harsh coat is one of the distinguishing features of the breed. The coat is absolutely straight and off standing on the main trunk of the body but generally lies somewhat flatter on the limbs. The coat appears healthy without being shiny or lustrous. Acceptable coat lengths may range from extremely short "horse coat" up to the "brush coat," not to exceed 1 inch in length at the withers. A soft coat, a wavy coat, a coat in excess of one inch at the withers or a coat that has been trimmed is a major fault. The Shar-Pei is shown in its natural state. Deviation from a scissors bite. Spotted tongue. A soft coat, a wavy coat, a coat in excess of 1 inch in length at the withers or a coat that has been trimmed. Pricked ears. Solid pink tongue. Absence of a complete tail. Albino; not a solid color, i.e. : brindle; parti-colored; spotted; patterned in any combination of colors. Click Here to Learn about breeder background checks on Chinese Shar-Pei breeders if you are looking for Chinese Shar-Pei puppies for sale. Click Here to learn how ResearchBreeder.com can help you find healthy Chinese Shar-Pei puppies for sale. Click Here to order a Breeder or Kennel Background Check on Chinese Shar-Pei Breeders that may have Chinese Shar-Pei puppies for sale. Click here to find the national breed club for Chinese Shar-Pei puppies for sale. 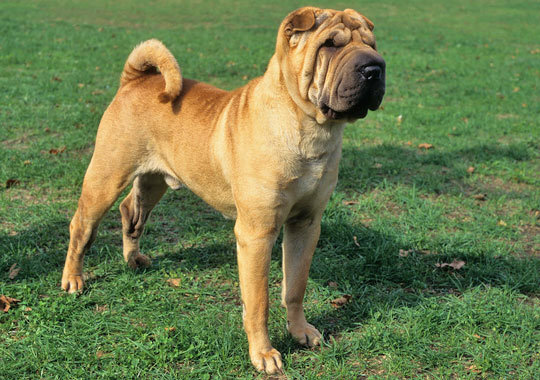 Click Here to purchase a list of approved ResearchBreeder.com Chinese Shar-Pei Breeders who have Chinese Shar-Pei puppies for sale.